Shirt (Required by Pack 157)—The official uniform shirt is available with long or short sleeves and has button-flap pockets and "Boy Scouts of America" lettered in gold above the right pocket. Belt (Required by Pack 157) —Official navy-blue web belt with metal buckle and Tiger Cub, Cub Scout, or Webelos Scout emblem. Socks —Official socks (not Required by Pack 157)are available in three lengths: ankle, crew, and knee. Tiger Cub socks are navy blue with orange tops; Cub Scout socks are navy blue with gold (yellow) tops. Cap (Required by Pack 157)—Official navy-blue cap with orange front panel and tiger cub emblem for Tiger Cubs, yellow panel and wolf emblem for Wolf Cub Scouts, blue panel and bear emblem for Bear Cub Scouts. Webelos Scouts wear an olive cap with a plain panel bearing the Webelos logo. You can also wear the solid blue cub scout hat with the cub scout logo. Neckerchief (Required by Pack 157)—Triangular neckerchief is orange with navy-blue trim for Tiger Cubs, gold with navy-blue trim for Wolf Cub Scouts, light blue with navy-blue trim for Bear Cub Scouts, and plaid for Webelos Scouts. Official BSA neckerchiefs are the only neckerchiefs boys should wear. Packs should not make their own pack neckerchiefs for boys. Neckerchief slide —Official gold-tone metal slide (not Required by Pack 157)with the Tiger Cub, Cub Scout, or Webelos logo. Boys may wear handmade neckerchief slides. The Webelos Colors consist of woven green, red, and gold streamers (tabs) on a blue metal bar with the border and word "Webelos" in gold. It is worn on the right sleeve immediately below and touching the U.S. flag if no Den number is worn If Den number is worn, under and touching the Den number. If colors are worn, activity badges are worn on the tabs. Webelos Colors are an optional uniform item, and if a Webelos Scout opts to not wear their colors, the Activity Pins are attached to the Webelos cap. The Webelos Colors were nearly phased out in the 1980's however an outcry of opposition has kept this traditional Webelos item in existence. There is little documentation on this item and is nearly extinct in the Webelos Scout Book. There is no set requirement for obtaining the Webelos Colors Pack 157 present each boy with his colors when he recieves his first Webelos Pin. 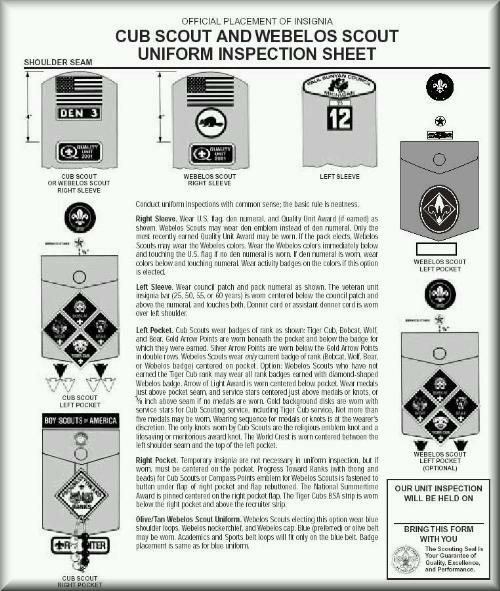 For guidance on the proper placement of all badges and insignia, see the BSA's Uniform and Insignia Guide (No. 33066, available at your local council service center) or download the uniform inspection sheet from the forms page.